The brethren of Vale of Skelmersdale Lodge No 8719 and their many guests gathered at Ormskirk Masonic Hall for the installation of Peter Scott as their new WM and for the evening’s ceremony, the lodge was honoured by the presence of Ian Gee as their principle guest and the representative of the Provincial Grand Master Tony Harrison. 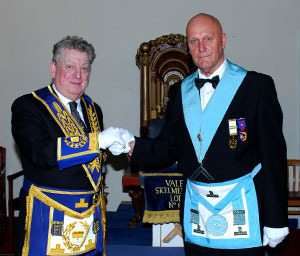 Ian Gee (left) congratulating Peter Scott on becoming WM. Ian was accompanied by Graham Chambers, the Ormskirk and Bootle Group Chairman and acting Provincial grand officer Rick Walker. The outgoing and installing WM Martyn Huyton-Berry started the evening’s proceedings by warmly welcoming the visiting brethren to the meeting and once the lodge’s initial business had been completed, Kenneth Meath the lodge’s DC was admitted into the room. Kenneth announced that Ian Gee was without and sought admission. Ian was then duly admitted into the temple, accompanied by Graham Chambers and Rick Walker. Once the procession was seated, Martyn asked James Holt if he would assist the lodge by occupying the chair of SW, Bryan Davidson if he would occupy the chair of JW and Philip Dickinson if he would assist the lodge by acting as inner guard. 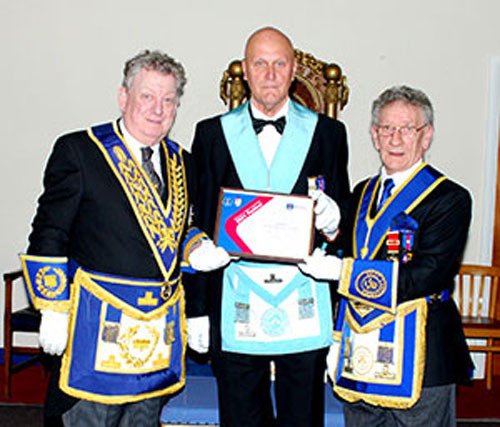 The master elect Peter Scott was then presented to the lodge by the presenting officer Kenneth Meath and after Peter had taken his obligation, Martyn thanked the brethren for all their support and hard work they had given him during his year in office. Martyn then proceeded to install Peter, according to ancient custom into the chair of King Solomon. The working tools for the third degree were presented by Clifford Boynton, the second degree tools by Ivan Hicks and the first degree tools by David Woods, all three degree explanations delivered in a faultless and excellent manner. During the investiture of the officers of the lodge the address to the deacons was delivered by Bryan Barton Collier and the address to the tyler was delivered by Philip Dickinson. Once the lodge’s officers had been invested, the address to the WM was given by Bryan Collier, followed by the address to the wardens by Kenneth Meath and the address to the brethren of the lodge by Ian Gee; all delivered in their usual confident and excellent manner. Ian Gee (left) presents Peter Scott with the MCF 2021 Festival Patron certificate, with Malcolm Sandywell (right) watching. At the end of the ceremony of installation, Ian addressed the brethren of the lodge by bringing congratulations on behalf of the Provincial Grand Master Tony Harrison, wishing Peter and all the brethren the very best of health and hoping they have a happy Masonic year. Ian then congratulated Martyn on Tony’s behalf for the way in which he had installed Peter into the chair, before proceeding to congratulate all the brethren who had taken part in the ceremony. The ceremony now being completed, Peter had the privilege to presented Ian with four cheques for charity, £1,000 for the West Lancashire MCF 2021 Festival, £100 to the North West Air Ambulance in memory of Mrs Jean Berry, £50 to Tithebarn and £50 to the RNLI New Brighton Lifeboat. Ian also announced that the lodge had already donated £300 to the MCF 2021 Festival through the monthly white envelopes Ian on behalf of the recipients thanked the brethren of the lodge for their very generous and worthy donations. After the cheque presentations the group charity steward, Malcolm Sandywell stood up and asked Ian if he wished to present the lodge with their Patron certificate on behalf of the MCF 2021 Festival, which Ian accepted and presented the certificate to Peter. After closing the lodge in prayer and harmony the brethren made their way to an excellent festive board. Pictured from left to right, are: Graham Chambers, Ian Gee, Peter Scott, Martyn Huyton-Berry, Malcolm Sandywell and Rick Walker.